Providing you the best range of floor marking tapes with effective & timely delivery. We offer excellent quality Floor Marking Tapes which are manufactured using high quality PVC. These tapes are resistant to chemicals and other moving objects. Floor Marking Tapes are durable self-adhesive PVC tapes used for floor marking and hazard warning. 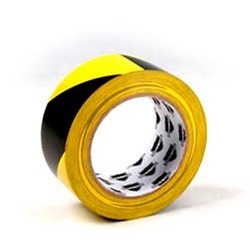 Self adhesive hazard marking tapes are available in plain colors or striped chevrons. These are heavy duty plasticized PVC film coated industrial tapes with an aggressive pressure sensitive adhesive.